“When I began this course, being accepted at Central Saint Martins seemed like a feeble hope, but it has actually been realised and I begin the Foundation on the pathway Performance Design and Practice at CSM in September 2014. At the first day of the course I was nervous that all the others would be miles ahead of me since I’ve never done any serious drawing before, but the friendly and warm environment at London Art Portfolio gave me the confidence to jump in headfirst and just draw. 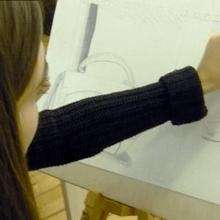 At London Art Portfolio you are encouraged to seek inspiration everywhere, whatever stirs your passion, and afterwards introduced to an imaginative range of materials and techniques to visualise your ideas. As a 3D student, who wants to study set and costume design for theatre and screen, I was encouraged to research different areas of 3D design and use that for inspiration, and then use this as a “catalyst” for the project that should end up as being my portfolio. The process was great fun and everyone on the course was really friendly and bounced off on each other’s skills and ideas. It was a pleasure to be there! Besides encouraging me creatively, Julia was a great help if there ever appeared a problem with the applications and helped and guided me through different situations that would have left me with bald patches otherwise. “Da jeg startede på Julia Dennis’ skole ”London Art Portfolio”, havde jeg kun et spinkelt håb om at kunne blive accepteret på en Foundation i London – men det er rent faktisk sket, og jeg starter på Central Saint Martins Foundation på studieretningen “Performance Design and Practice” til september 2014. Den første dag var jeg nervøs for, at de andre kursister ville være i en hel anden liga end mig, fordi jeg aldrig rigtig havde tegnet før, men jeg fik en varm velkomst, hvilket gjorde mig tryg nok til at kaste mig ud i det. Hos Julia bliver du opmuntret til at søge inspiration overalt, hvad du finder interessant, og derefter introduceret til en række forskellige metoder og materieller, som hjælper dig med at visualiserer dine ideer. Som en ”3D-studerende”, som vil læse scenografi, mente Julia, at jeg skulle søge inspiration i andre 3D design og bruge dem som en ”katelysator” for projektet, som skulle ende med at blive til min portfolio. Hele forløbet var rigtig spændende og alle på kurset var virkelig søde og blev inspireret af hinandens evner og ideer. Det var virkelig en fornøjelse at være der! Udover at hjælpe mig med det kreative, ydede Julia en stor hjælp mht. de engelske universiteters lettere besynderlige ansøgningsformer, hvor det viste sig at være problemer i flere sammenhæng. 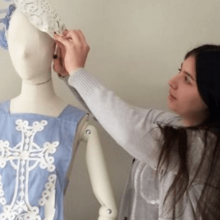 “From my 1:1 tuitions at London Art Portfolio, I’ve not only reached my goals of getting into Central Saint Martins, but I’ve broaden my artistic skills and creativity. I was able to develop my drawing skills, through the use of mixed media, including collaging and Photoshop, which I was not exposed to at A level art. I was taught how to expand my ideas, think outside the box, through artist, and historical research, a fundamental foundation for a strong portfolio and more importantly, build a strong concept, which made my portfolio unique and stand out at interviews. Before coming to London Art Portfolio, I was only exposed to the fine art direction, however, after a few weeks at London Art Portfolio, I was introduced to graphic design and fashion; and immediately found my new interest for fashion. The incredible book range available at London Art Portfolio, helped me with my research, I was able to develop my design visualisation into realisation. 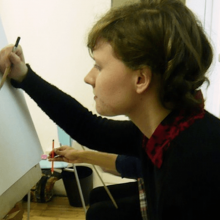 I received a lot of help with my personal statement and guidance throughout applying to art school, I was given advise on different courses and which university to apply to, to meet my own personal interests. 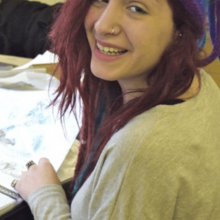 “As a whole, the London Art Portfolio course was an extremely good experience for me. The atmosphere was very creative, free and friendly. Julia Dennis had a great way of helping me to organise my work for my portfolio, and most importantly, to make me understand what I want my work to be like. I learned a lot about presentation, experimenting with different mediums and the overall requirements of a portfolio. As I have progressed to my Foundation course and my BA, these skills have come in handy on many occasions. When I first started the London Art Portfolio course, I had just finished high school and had very little idea of my future studies. Working with Julia helped me secure a place on a Foundation Course at London College of Communication, and later on a place on BA Womenswear at Central Saint Martins. Before I attended London Art Portfolio, I attempted working on my portfolio for CSM (yes I was aiming high) but this quickly ground to a holt. I opted for the 4 week preparation of the portfolio course at London Art Portfolio where I met Julia. This proved to be one of my best decisions. “Kurs zaczęłam w lipcu 2012 roku. W wieku 32 lat, nadal pracując jako modelka, stwierdziłam, że chcę zmienić swoje życie i pójść w nieco innym kierunku. Zawsze interesowałam się sztuką, ale nie skończyłam żadnej szkoły o profilu plastycznym, więc nie wiedziałam czy to teraz będzie możliwe, aby próbować swoich sił na kierunku artystycznym.